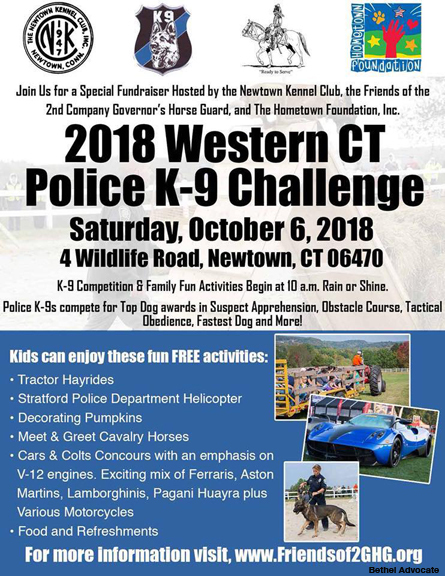 (Newtown, CT) – The Newtown Kennel Club (NKC) and the Friends of the Second Company Governor’s Horse Guard (Friends of 2GHG) will host the Third Annual Western CT Police K-9 Challenge on Saturday, Oct. 7 at the Second Company Governor’s Horse Guard (2GHG) Headquarters, 4 Wildlife Drive, Newtown, CT. This fundraising event kicks off at 10 a.m. with K-9 competitions, daylong kids activities, vendors, food trucks, halftime demonstrations, and award ceremonies at 3 p.m. Teams including German Shepherd Dogs, Belgian Malinois and Labrador Retrievers, will compete in suspect apprehension, obstacle course, tactical obedience, the fastest dog, and more. The nine highest-scoring teams, based on points earned in each division – Best Overall Team, Best K-9, and Best Handler – will earn a first, second, or third prize ribbon and medallion, donated by the Newtown Kennel Club. Back again this year is the Stephen A. Ketchum People’s Choice Award which will be given to a fan favorite K-9 team. Newtown Police Department K-9 Aris, a 2-year-old German Shepherd Dog, will make an appearance during halftime demonstrations. Newtown’s newest K-9 was made possible by a $15,000 donation from the Newtown Kennel Club. For the safety of all, only Police K-9s are allowed on the grounds. Spectators are asked to please leave their dogs at home. Tractor Hay Rides – Ride in a hay-filled wagon pulled by a tractor around the 2GHG grounds. Treasure Hunt with Prizes – Kids of all ages can follow a treasure hunt map around the grounds to find clues to win prizes. Pumpkin Decorating in the Saint Michael Pumpkin Patch – Explore your creativity with markers, paint, glitter, and glue to make your Jack or Jill O’ Lantern your own to bring home. Meet & Greet Cavalry Horses – Visit the paddocks to pet the brave horses of the Cavalry. Kids’ Games – A variety of games will be on hand to win more prizes! Two Car Shows – Double your automotive fun! One show of classic cars and one show of exotic cars. Food Trucks – And when hunger strikes, food trucks galore will be on-site. All proceeds will benefit the Friends of 2GHG, a 501(c)3 non-profit organized by former members of the 2GHG for charitable and educational purposes. The Friends are dedicated to promoting the public interest in, and general welfare of the 2GHG. The 2GHG was chartered in 1808 by the General Assembly as a Connecticut state militia unit and is one of the oldest and last active cavalry units in the United States. In recent years, as state funding has dwindled, the horse guard has had to rely on private donations to operate and stay at their facility in Newtown. The 2017 Western CT K-9 Challenge is sponsored by ACI Dynamix, Harvest Properties, K-9 Crime Stoppers, Pet Aesthetics Salon & Boutique LLC, The Hometown Foundation, Inc., and Thermo King.